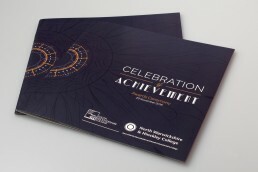 North Warwickshire & South Leicestershire College holds an annual awards ceremony to celebrate student achievement and graduation. 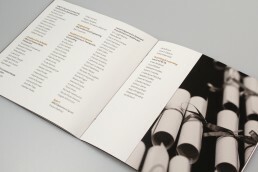 This ceremony is prestigious and is usually held at stylish venues around the Midlands, it is accompanied by printed material such as certificates, programmes, tickets as well as digital material including animated videos and presentation slides. 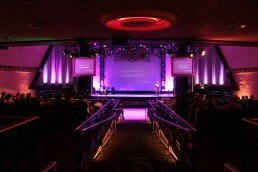 This year’s theme idea was derived from the venue at which the awards were taking place – Athena in Leicester. 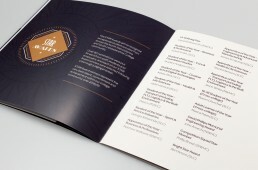 The Art Deco character of the building helped define the whole look and feel of the awards branding. 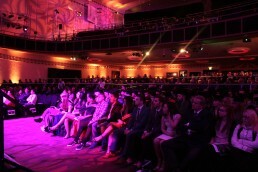 One of the main focal points of the evening was an animated video sharing all the successes throughout the year. This uplifting and informative video was played during the Principal’s speech which helped set the celebratory tone for the event.